A person struggles to carry cardboard boxes from a moving van, thinking, "These boxes of books sure are heavy. I'll visualize my dragon form, and focus on its qualities of strength and balance!" The shining silhouette of a dragon astral form appears around xir. The dragon picks up a box with xir forelimbs, extending xir wings and tail. Caption: "When a quadrupedal dragon rears up bipedally to carry a heavy object, xe instinctively counterbalances the burden by unfurling xir wings behind xir." This is illustrated with a old-fashioned balancing scales, sitting level. 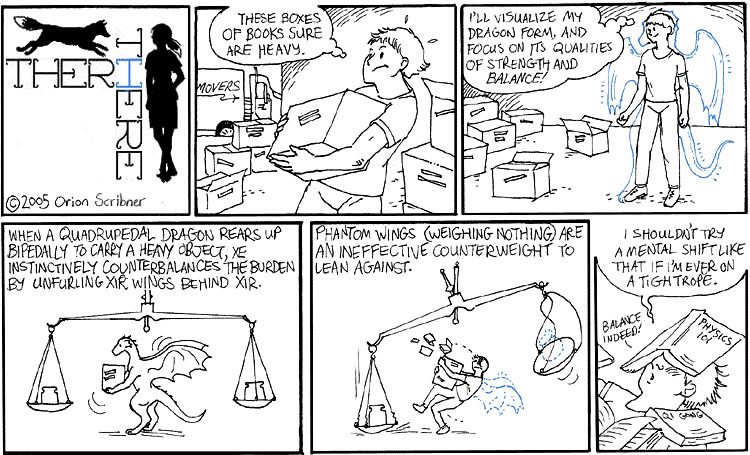 Caption: "Phantom wings (weighing nothing) are an ineffective counterweight to lean against." The weight vanishes from one side of the scales, and they collapse to the other. The dragon otherkin falls over, spilling the box. Under a pile of textbooks such as "Physics 101" and "Qi Gong," the dragon kin says, "I shouldn't try a mental shift like that if I'm ever on a tightrope," and then mutters, "Balance indeed!"